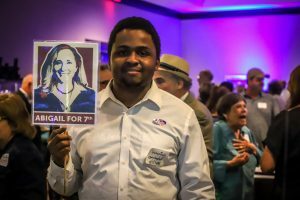 “We’ve taken a massive step closer to bringing new representation to our district,” said Abigail Spanberger after accepting the Democratic nomination for Virginia’s 7th District. Winning handily in a lopsided Democratic primary election against former Marine Corps Colonel Dan Ward, Spanberger will now go on to challenge Republican Congressman Dave Brat in a race that will be watched nationally. While this is Spanberger’s first foray into elected politics, she is no stranger to government service, having begun her career as a federal law enforcement officer with the US Postal Inspection Service before becoming an operations officer with the CIA. Spanberger has been clear about why she is running for elected office, telling MSNBC’s Kasie Hunt only last month that it was about cutting through the toxic politics. Another supporter of Spanberger, David Parsons, said he was supporting the former CIA agent because of her stance on health care. She now faces the formidable task of toppling Republican incumbent and tea-party darling Dave Brat in November. Brat, a former economics professor at Randolph Macon College, won in a historic upset against then-House Majority Leader Eric Cantor in 2014. Landon Shroder contributed to this report. 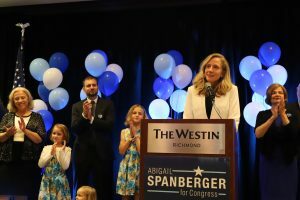 When asked about making the jump from intelligence professional to civilian politics, former CIA agent and Democratic primary candidate for Virginia’s 7th District, Abigail Spanberger, had a very distinct answer. “My whole role was to become a subject matter expert on a variety of different topics at a variety of different times.” As an intelligence professional, Spanberger had to use her analytical skills to cover issues like nuclear mitigation, science, technology, and narco-trafficking. 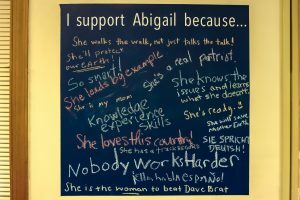 While these skills on the surface might seem to apply only to the world of a professional spy, Spanberger explains how they have prepared her for life on the campaign trail. “What is the most transferable of these skill-sets is understanding really complicated topics that have inter-related challenges and then communicating them back to other people.” And as a legislator, this is how she would assess the most critical issues that her district and the US faces; as a series of policy initiatives that connect across issues. Spanberger, like her primary opponent Dan Ward, stands out in this election cycle because of the vast foreign policy credentials she gained while working abroad. A former law enforcement officer for the US Postal Inspection Service, Spanberger went on to become a core collector with the CIA, responsible for enlisting sources and gathering intelligence that informed national security policy. To obtain this position, recruitment can take anywhere between 12-18 months and includes extensive background checks and polygraph testing, along with medical and mental evaluations. 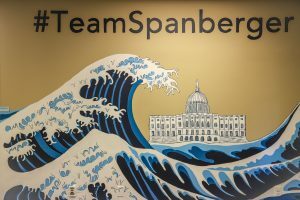 RVA Mag caught up with Spanberger at her campaign office in Henrico to take the temperature on what is happening around the globe and how her experience abroad is playing out on the campaign trail. “My experience in foreign policy and in the intelligence world would be incredibly unique,” said Spanberger, when asked if she would tackle foreign policy in Congress. Indeed, her experience is unique and she is only one of two other women with these spooky credentials running for Congress this cycle. The other being Elissa Slotkin, a Democrat running in Michigan who was also in the CIA. Despite this, she was quick to clarify that her passion for serving was not only her commitment to country, but also helping people understanding complex things. My interests can easily pivot from North Korea nuclear policy to Latin American leadership issues to health care, tax policy, and mental illness,” said Spanberger. Nonetheless, a lot is happening in the world, and it is not often that one hears directly from a former CIA agent running for Congress about the dangers lurking in the shadows. Because of the frenzied inconsistency of this strategy, foreign policy professionals have been at a loss for how to conduct business. Yet from a certain perspective, gains have also been made, such as the announcement that North and South Korea will officially end hostilities after 65 years. This presents a problem for Democrats running on foreign policy credentials, something Spanberger was pressed on in terms of how the administration should be credited. 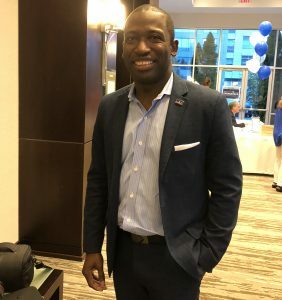 One of the defining features of this political age is the way in which fringe messaging which borders on the conspiratorial has become mainstream, and this year’s election cycle in Virginia is no exception. In fact, the sitting incumbent for the 7th District, Congressman Dave Brat, has been called out more than once for re-tweeting conspiracy theories, most notably after the school shooting in Parkland, Florida. Spanberger has not been immune to this messaging either, being pinged by publications like The Gateway Pundit as being part of a “deep-state conspiracy” due to her CIA background. “So I have gotten the deep state narrative,” she said. “I would write something on Facebook about healthcare and they would write ‘you’re deep-state we shouldn’t listen to you’.” This messaging has only been emboldened by a roster of up and coming Democrats who have foreign policy and intelligence credentials, along with Trump’s attacks on the Justice Department claiming they are engaged in a deep-state conspiracy against his presidency. 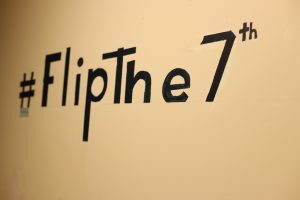 “There are a couple of us running and the Washington Post ran an article about Elissa and me, and that got a lot of play and that’s when it picked up.” In an age of foreign-based social media campaigns, Spanberger was quick to point out that these were not Russia bots, but people living in Virginia’s 7th District. While foreign policy is built into the DNA of the Spanberger campaign, her focus still remains local. Ward is not your usual Democratic contender in Richmond, let alone Virginia. A former Colonel in the Marine Corps, Ward was a fighter pilot who flew combat missions over Iraq, Bosnia, and Kosovo, before joining the State Department to work on cooperative defense programs in Syria and Ukraine. 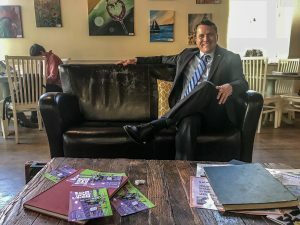 The primary for the Democratic Party nominee in Virginia’s 7th District is unique this year, least of all because of the foreign policy credentials of the two main challengers. Ward’s main opponent in the primary is former CIA agent, Abagail Spanburger. Nonetheless, the contest to unseat incumbent Republican Dave Brat is one of the races to watch nationally in this year’s mid-term elections. He is a yes man for this administration, period,” Ward quickly pointed out, when speaking about Brat. “He is more focused on working for Wall Street, corporations, and PACs then he is in doing anything for the state. While all politics is inherently local, the time spent overseas by both candidates cannot go unnoticed, more so as US foreign policy remains in constant flux under President Trump. The challenges the US faces abroad are vast and run the global spectrum including Russia, North Korea, Iran, rising nationalism and nativism, chemical weapons usage in Syria, and a resurgent China. For a variety of reasons, this is what makes the Democratic Primary race in the 7th District so interesting. Given these complexities, RVA Mag wanted to catch up with Ward and talk about some of these foreign policy challenges and how he assesses the strategic chessboard. When asked if he sees himself as a foreign policy candidate, he answered with a quick and confident, “for sure”. Yet where does one begin in measuring the successes and failures of the great game between nations? It didn’t take long to find out where this should be. “It all starts with Russia,” Ward answered. Facebook and various social media platforms were obviously part of the asymmetric toolbox. Another assessment by the same think-tank also stated that since 2004, Russia has meddled in the politics of at least 27 other countries. Despite the current conditions surrounding the conflict, the US was heavily invested in providing non-lethal support during the early stages of the revolution. 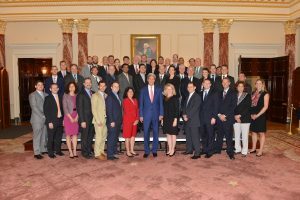 “From the State Department side, I was part of a logistics support program,” said Ward, when talking about his diplomatic role in providing supplies to groups like the Free Syrian Army. On the campaign trail, Ward says that he talks about the “assault” on the rule of law from bad-actors like Russia and how the lack of effective policy has affected the US standing globally. “The damage that he [Trump] is doing to our foreign policy is a long-term [issue], even if he is not there long term.” Of the possible solutions to current foreign policy challenges that Ward “110 percent” supports is the transfer of authority for the use of military force back to Congress – a policy currently being championed by Sen. Tim Kaine. “It is time for Congress to be the political branch of government they are supposed to be,” said Ward, adding that legislators have abdicated their responsibility and the executive branch has filled that role.